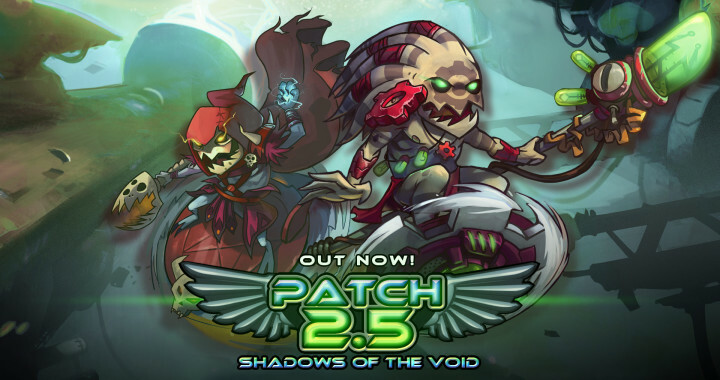 Patch 2.5: Shadows of the Void released! Patch 2.5 has launched and brings you a new character, an AI Editor and is now fully playable in Brazilian Portuguese! The AI Editor will let users tinker around with existing bots or create new ones from scratch. This means you can create bot behaviour for every character in Awesomenauts! These custom bots can be used in Custom Matches and ,if good enough, may end up in the game itself for everyone to enjoy. The editor already features a wide range of functionality and debug tools but will receive new features periodically for users to play around with. You can follow community progress and find custom made bots in the newly added Modding Forum! We’re also showing some love to our large Brazilian Awesomenauts playerbase, who brought us gems like the LBA (Liga Brasileira de Awesomenauts) tournament and many other cool spin-off competitions, by supporting their language in the game! Now they can play Awesomenauts in their native Brazilian Portuguese. This patch also sees the entry of our newest Starstorm member: Skree! This little floating Techno-Shaman has been burrowing around in the deep recesses of the Starstorm Station. Down among the wires and all the crude machine-parts, Skree built many idols to the Robot Tech-Gods he found all over the place. After the Starstorm was accidentally jump-started back to life by one of his many tinkerings his statues did the same, convincing Skree that the spirits of technomancy wanted him to pursue a new vision-quest. This event led him to the Awesomenauts where he uses his gigantic Saw Blade-tossing and Idol-crafting skills to hunt down all non-believers of the Technomancy! You can read all the 2.5 patch notes here and see the entire Vault (featuring Skree’s Premium Skin and music) right here!